While hanging out below Three Creek Lake in Sisters we decided to be as wasteful and inefficient as possible and take the drive over into Lebanon to pick up our mail at the UPS Store. On the way there along Hwy 20 we saw signs for Cascadia State Park and liked the name. Once we got our mail and packages we filled up with gas and started back towards our new camping spot which our traveling companions of late had already headed away towards. By then it was getting late, we’ve had a long day on the road and were not too keen on another 2 hours of driving to the new spot. 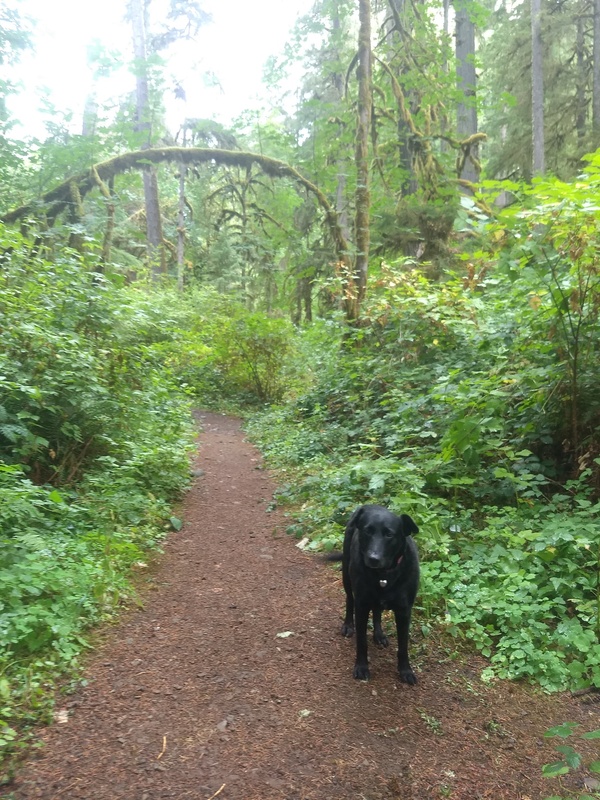 Plus, with the need for a shower now blatantly obvious even to an allergy-afflicted nose such as mine we decided to break our guideline of not paying for camping and took the turn into Cascadia State Park. We pulled in, found an unoccupied spot, filled out the pay envelope and set up camp. The $17 price is not terrible but usually, when we pay we are at a federal campground (Forest Service, BLM, National Park) and our Access Pass gets us half off. We have seen that some state parks (none in Washington State) have decided to honor the national access pass even though they have no need to but there was no one around that we could discuss that possibility with and so we paid the full price and vowed to get every last dollar worth with a long, hot shower. It was a bit of a drizzly night and so what gear we had set out on the picnic table we covered with a tarp. It rained off and on throughout the night so the next morning everything had a clean, wet sheen and the air smelled awesome of forest and season’s change and petrichor. After the morning coffee ritual we packed up our stuff, took that long, hot shower, dressed in nice, clean clothes and then decided to get all sweaty again with a hike…or two. 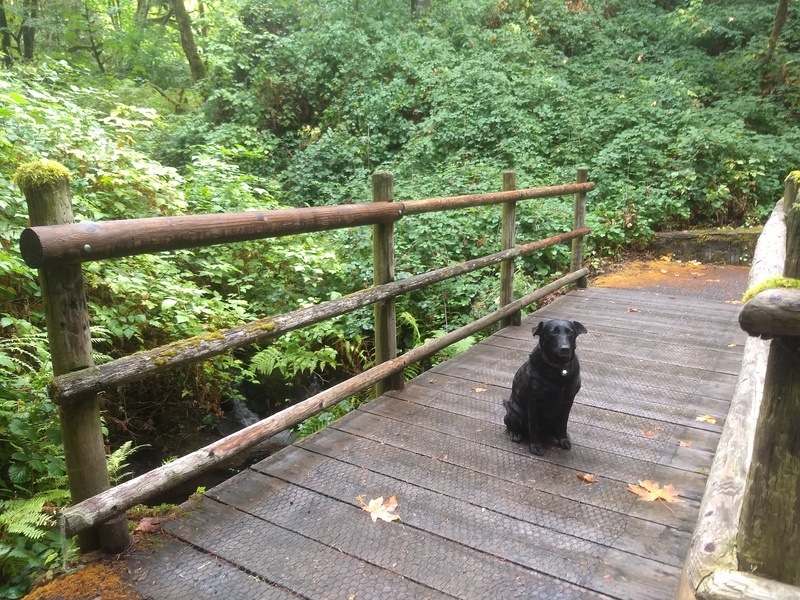 Cascadia State Park includes two primary hiking trails. 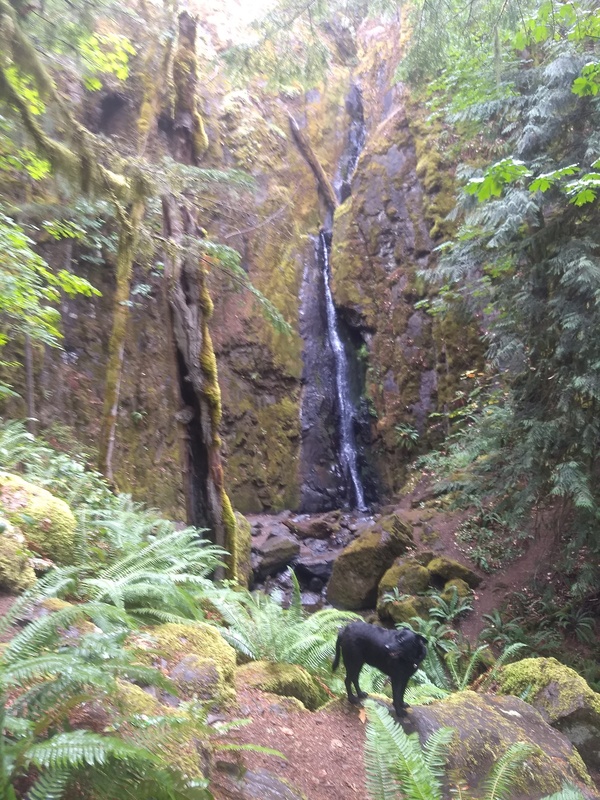 The first is the 3/4 mile loop River Trail which heads down from the campgrounds to the South Santiam River. 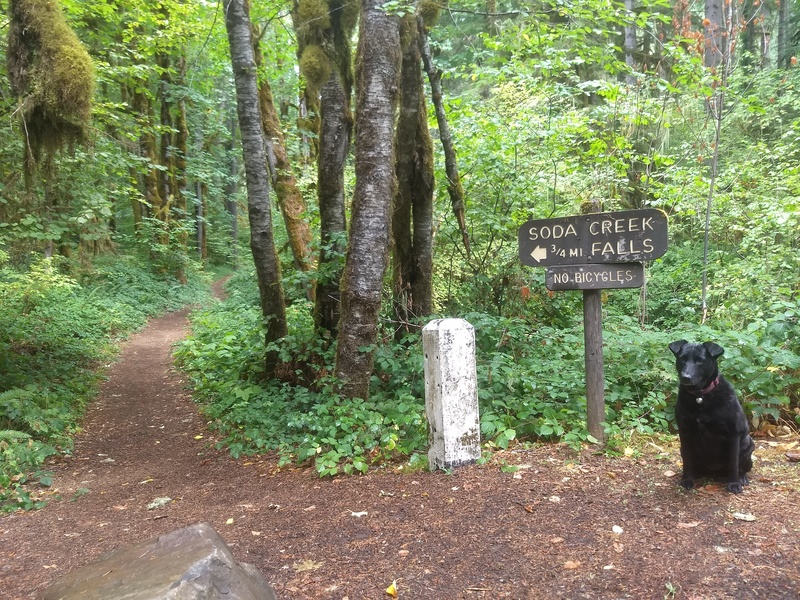 The other main hike is the 1.5 mile round trip Soda Creek Falls Trail which follows Soda Creek up to Lower Soda Creek Falls. We took the first, easier hike through the group camping area and down to the river. It was a relatively easy hike except for most of the stone steps being non-uniform in size so a plan had to be consciously figured out before each step. 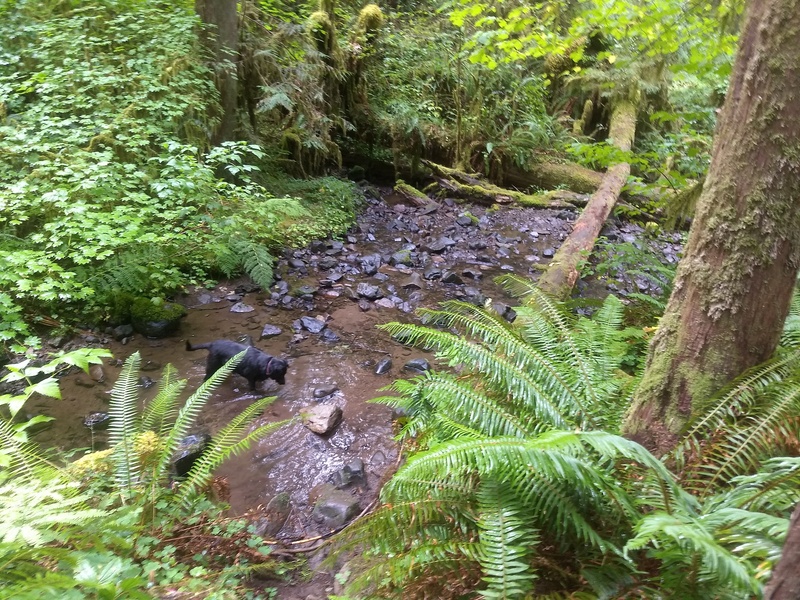 Once we pushed through the dense tree cover lining the river it was a lovely sight with crystal clear, slowly flowing water, moss-laden trees and rain-slicked rocks in abundance…and of course I left my phone back at the campsite. No pics for you. 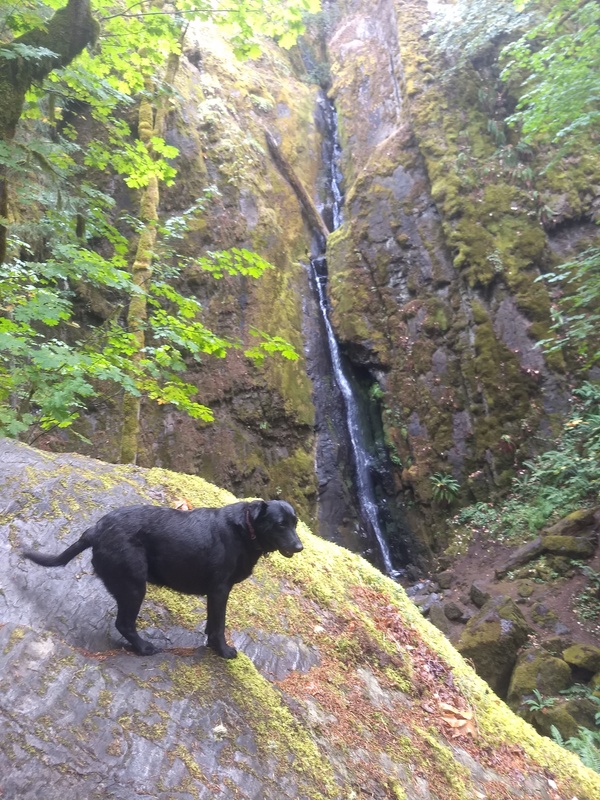 Since that was a bust documentation-wise we decided to make up for by taking the second hike up to Soda Creek Falls. The trail started out flat and nicely maintained. If we had not known better we would have thought this was an ADA accessible path (but it is not). We crossed over a couple of small wooden bridges that crisscrossed the creek as we headed ever so slightly uphill. Along the way we passed under a tree that had at some time in the past been bent over the trail making a nice moss-covered archway. Soon enough though the trail turned sharply steeper and less maintained with ruts, rocks and tree roots making footholds less sure by the moment. Sometimes on spur-of-the-moment walks/hikes I wear whatever footwear I happen to have on. This time though, luckily, I had made the wise decision to put on good Bridgedale Hiking socks and my Keen hiking boots (Built in the USA!) which in combination made short work of those obstacles. The previous night’s drizzle had not helped either making the dirt somewhat muddy and the sections of clay slippery which meant watching every step. That was a good thing though as I almost stepped on a small “twig” which moved at the last instant and we made a new baby snake buddy. 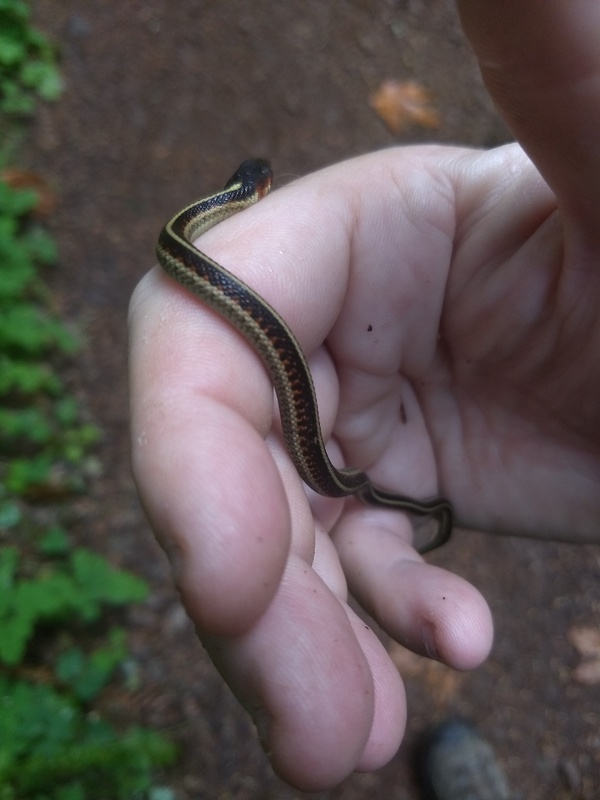 The young (weeks old at most) Garter Snake was not too keen on being picked up but he didn’t bite and soon enough relaxed in my hand contentedly, probably enjoying the heat that my hand put off. We said “hi,” thanked it for being a cool creature, wished it a long and happy life, set it down and it slithered on its way none the worse for the experience. 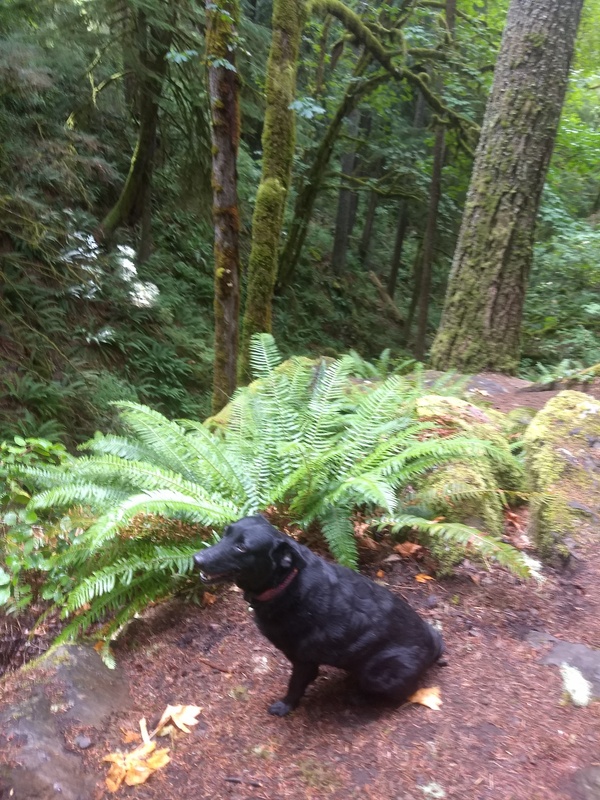 As we hiked ever upwards we were surrounded by a thick canopy of Douglas Fir, cedar and hemlock above us while ferns, mosses, a variety of flowers and some mushrooms were alongside the path. Numerous slugs wandered about on the trail as well. Their body type looked like Banana Slugs but they ranged in color from dark, graphite grey to brown with a reddish tint so…not Banana Slugs. Once we reached the falls we quickly realized that there are not a lot of good angles for photos. At 134 feet in total the falls cascade down narrow recesses in a large cliff made of basalt in three drops of 49, 39 and 54 feet respectively. The uppermost tier drops at a 90 degree angle to the other two. That angle and the shape of the alcove into which it falls makes it difficult to see from the area we were at across the stream. The falls are supposedly perennial and, even with signs of autumn around us and the rain the previous evening the falls themselves were…how do I say this nicely, unbreathtaking. Pictures I have seen show that later in the year the fall’s volume increases dramatically for what we are sure is a better showing. If we are back in the area at that time of the year we would not hesitate to do the day-use thing, not have to pay and just take the quick hike up to the falls. We thought about scrambling over the wet, slippery rocks to get down to the base of the falls but decided not to risk a “whoops” and possible injury now that we were deep into our second hike of the day. Looking back down the way we had come you could look to the left and see the steep-banked, dark green, tree-lined slash in the Earth we had just hiked past on the way up. 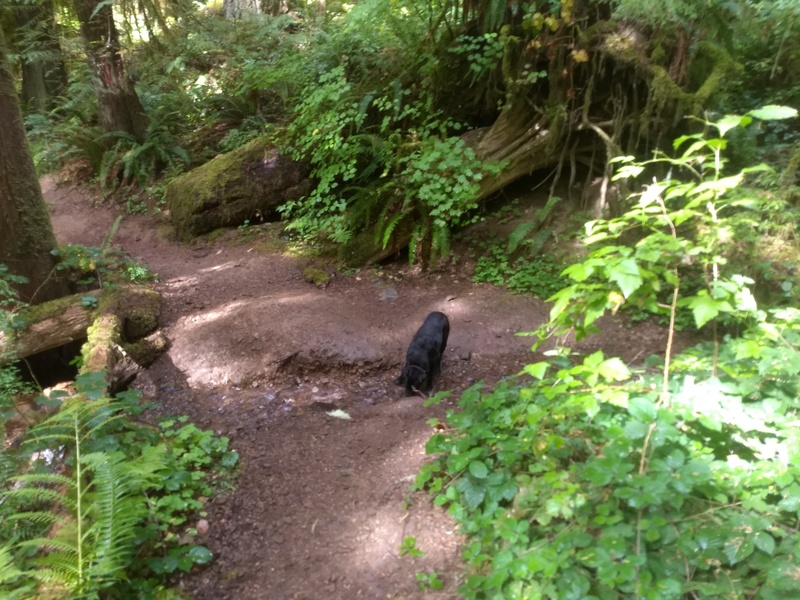 On the way back down Willow stopped a couple of times to slake her thirst, once in a small feeder stream and a second time in Soda Creek itself. Once back down the trail we decided to walk over and read a sign that we had seen from a distance as we turned onto the road that led to the group camping area and the trail to the falls we had just conquered. We soon found out a bit of history on the beginnings of what became this State Park. Although now capped there used to be a soda (mineral) spring a couple hundred feet from where the sign stood. We walked down the paved path to take a look. In 1895 a man named George Geisendorfer came here with his family to find the “bubbling waters” he’d heard about from long time locals. 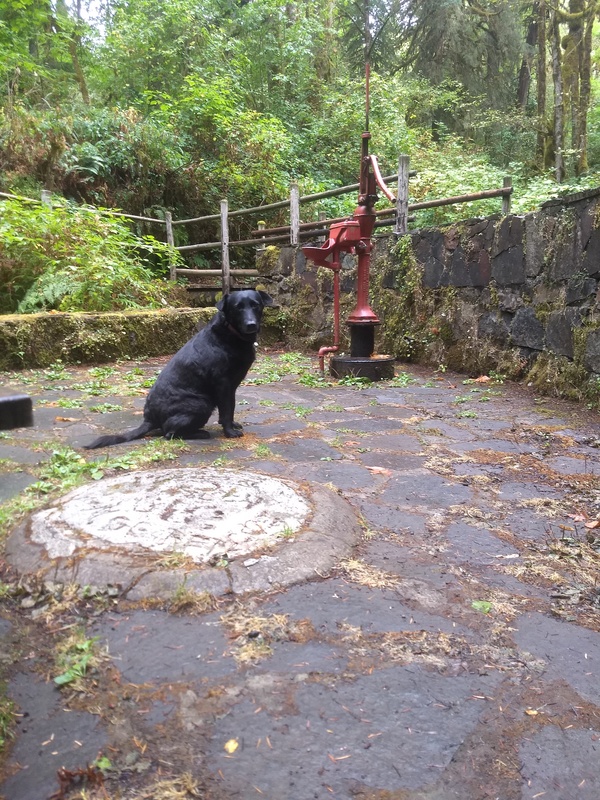 He had spent four years trying to recover from a bad case of pneumonia, believed soda springs possessed healing properties and was ready to try a “nature cure.” The family camped for the summer and eventually bought the land and opened it to visitors. Soon hundreds of people were camping here, some for weeks at a time. Geisendorfer’s health improved and he felt compelled to build a resort with a 30-room hotel and several cabins so that more people could experience the healing properties of the spring water and, I’m sure, so he could get paid for his efforts. 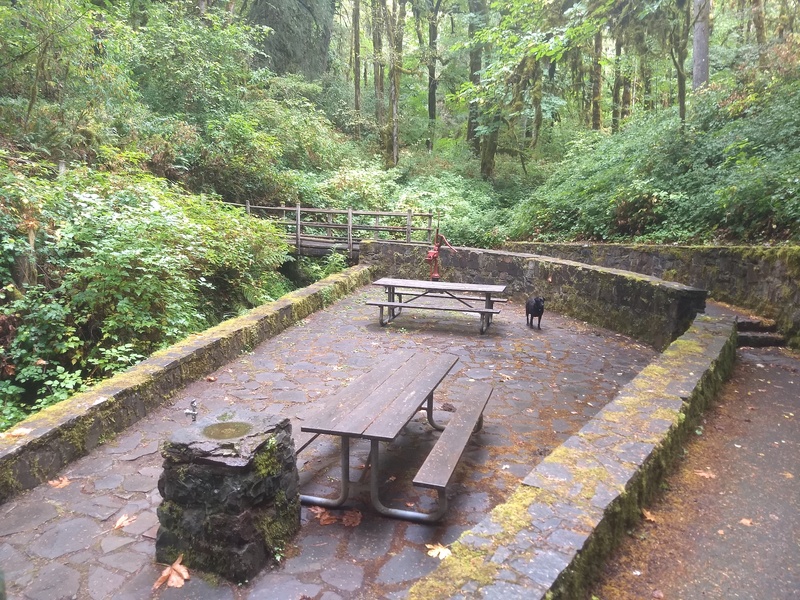 Oregon State Parks purchased Cascadia Springs from the Geisendorfer family in 1940. They tore down the dilapidated buildings and improved the area around the spring. The spring remained open and popular until the 1960s. Some hiking, some history. Considering we did all that in the span of a few hours on one morning it was a worthwhile outing. 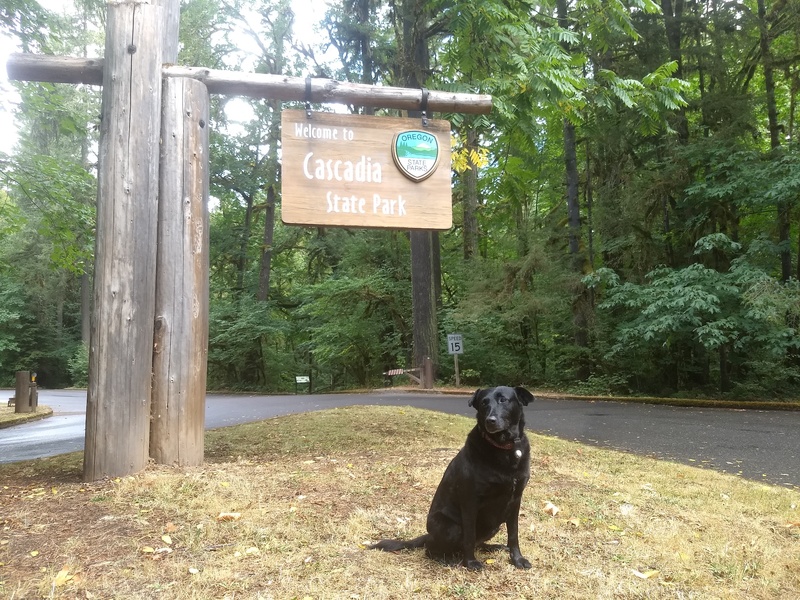 If you would like to visit Cascadia State Park it is located along U.S. Highway 20, 14 miles east of Sweet Home and 59 miles west of Sisters. Camping is available May 1 – Sep 30. Day Use is Year Round. Reservations are only accepted for the group camp sites and picnic areas. Enjoy your visit. We did. * Photos are from an interesting page of history on the springs here and are from the personal collection of Mona Hyer Waibel. They are used without express permission but for non-commercial purposes. Don’t sue me please.